Instructor: Dr. Phill Conrad, Lecturer (PSOE), Dept. of Computer Science (Joint Appointment, Coll. of Creative Studies). Prof. Conrad and your TA are also available by appointment—use email to request an appointment. Include "CS8" in your subject line, and indicate your available times. Introduction to computer program development for students with little to no programming experience. Basic programming concepts, variables and expressions, data and control structures, algorithms, debugging, program design, and documentation. None: but we do expect familiarity with basic concepts from high school algebra, geometry and trigonometry—we'll review those as needed. Publisher: Jones and Bartlett, 2009. If you are registered for another UCSB course that overlaps with this one, you MUST HAVE specific written permission from both instructors, or I am within my rights to give you a failing grade on any work you miss as a result, and will NOT make any accommodations for you. Attendance is required at all lectures and labs (discussion sections) and is checked via homework submission. Quizzes may occur at anytime, announced or unannounced. Missed quizzes may not be made up. Thus attendance is required, and reading the assigned readings is required. I will then use the following table. This is a conventional 10 point scale with +, - with the lower three and upper three points of each range representing plus/minus. It also enforces a policy that your final course grade can be no more than one letter grade higher than your exam average. Curving: The grade scale above represents the minimum letter grade you will be assigned—at the instructor's discretion, the grading scale may be altered in the students' favor if this will be better reflect the students' mastery of the material. Thus, if there is a "curve", it will be applied at the end, not to individual assignments. This course is an introduction to Computer Science, and programming. Computer Science is the study of abstractions and algorithms. In Computer Science, an abstraction is a useful representation of something from the real world that allows us to work with it more easily or efficiently. An algorithm is a well-defined, step-by-step sequence of instructions that can be used to mechanically determine the solution to some well-defined problem. If you are looking in the index of a U.S. history textbook for "Gettysburg" you'll probably use an algorithm to find the entry quickly. Here the input to the algorithm is some topic, and the output is a list of pages on which that topic appears. If you are looking for a parking lot on campus, you might use an abstraction called a "map" to locate the parking lot. You know the features of a map, and how it corresponds to the reality of a college campus, and parking spaces. The way a map can work to help you find a parking lot (or garage) is the same whether it's a map of UCSB, Downtown Santa Barbara, or the Staples Center in LA. If you are searching through a parking lot (or garage) to either (a) find a parking space, or (b) determine that there are no spaces left, you probably use an algorithm to do that—again, without even thinking about what you are doing. In the case of using an index, this is probably an algorithm you may have learned in grade school, and it has been so long since you learned it, that now you don't even think about it—you just do it. Finding a space in a parking lot—and knowing when to give up and look elsewhere—is "just common sense"; this probably isn't something you were ever "taught", or even have to think very much about. You just do it. So, for the time being at least, it falls to humans to design algorithms that computers can use to solve problems. In many cases, these algorithms are "just common sense"—the computer equivalent of looking for an empty parking space in a parking lot (and knowing when to give up). Algorithms like this are easy to design. Many of the algorithms we'll see in this course are like that. In other cases, the algorithms are very complex, or very subtle, and coming up with them is a deep intellectual challenge. Furthermore, the impact of a better algorithm on society can be very large. For example, new algorithms in the field of computational science—modeling chemical and biological reactions with computer simulations—can lead to breakthroughs such as new drugs to fight disease, or renewable sources of energy. And often, what goes along with finding a good algorithm is finding a good abstraction of the real world concepts we are interested in: cells, molecules, oil fields, words, sentences, students, courses, GPAs, etc. Algorithms and abstractions really go hand-in-hand. 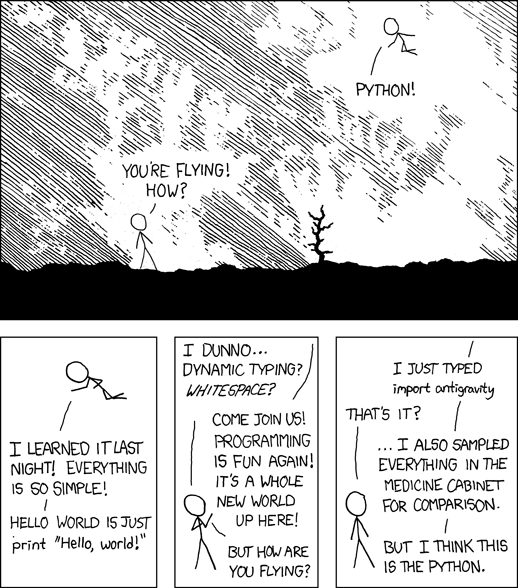 If you only learn one programming language, Python is a good choice—in spite of being easy to learn, it is not a "toy" language by any means. It is widely used by scientists and web application developers just for starters. Many internal systems at Google are based on Python code. I say that the course "provides an opportunity," because you will only become an good beginning-level programmer if you put a lot of time and effort into this course—that is true no matter how much thought and attention I put in my lectures, assignments, and exams. learn to paint by spending many hours putting brush to canvas. The same is true of programming. Programming is not a serious of facts to be memorized—you cannot "cram" for a computer science exam. You must practice, practice, practice. As a result, the workload in this course may feel heavy. It may even feel unreasonable compared to your other courses. However, I assure you that it is not unreasonable, given the goal of making you an skilled beginning programmer. Programming is a skill, and the only way to get good at it is lots and lots of practice, which takes lots and lots of time. The usual "folklore" rule of thumb is 8–12 hours per week for a normal college class*. That means you should expect, at a minimum to put in 5–9 hours per week on this course, on top of the 3 hours 20 minutes you spend in lecture and lab each week. To put it another way, I really should be giving you between 2 and 4 hours of homework between every lecture**. **I probably won't succeed in giving you that much work to do, but I really should, because that's the only way you'll learn what this course is supposed to teach! So, I'll do my best. If the work load is less than that, I apologize in advance for disappointing you. :-) . Reading—Between each class, you'll have reading to do in the textbook. There is too much information you need to learn in this course for you to get all of it in lecture, especially in the six-week compressed time-frame so the readings are essential. The reading assignments for the next class can be found on the homework assignments handed out during each class period. The homework often goes hand-in-hand These are typically pencil/paper type problems, though sometimes you'll need access to a computer to solve them. If you don't have reliable access to a computer at home (or in your dorm), please plan your schedule so that you can spend time in the CSIL computer lab between classes. Homework assignments are completed on paper—they may NOT be submitted in electronically—and may only be submitted in the class in which they are due. In this way, they also serve as an attendance check. Therefore, you may NOT turn in a homework assignment "on behalf of" an absent classmate, or have someone else turn in your homework for you—doing so in this course is a form of academic dishonesty. Programming Assignments (Labs)—Programming assignments (also called labs) are given once or twice a week, and are typically started in the Thursday lab sessions, and finished on your own time outside of lab. These will typically involve pair programming, which is described later in this syllabus. Lectures—Learning is something that you do as a student, not something that is "done to you" by a teacher. Therefore most of the learning you will do in this course takes place when you are actively involved in doing something challenging, i.e. during the homework assignments, and labs. Most of the information you will need to do those assignments will come from the reading. Therefore, you may ask, what is the purpose of the lectures? to provide an opportunity to ask questions, and hear answers to questions asked by others. Exams—There are three exams in this course—two midterms and a final. You may wonder why there are two midterms in a course that is only ten weeks long. The reason is that I've found that in order to succeed at learning the material in this course, many students need two opportunities for feedback on how they are doing before the final exam. Students sometimes are doing better than they think they are, or not as well as think they are, and the exams provide a "reality check". Keep in mind that the exams from last year's course may have occurred at slightly different points in the quarter, and the pace of material may have been different. So please take these as examples only of the "types" of questions asked on exams, not of what might be asked (specifically) on midterm 1, 2 or the final during this quarter. Everything is Cumulative—that's just how CS is. Finally—note that just as in a math class, everything we do builds on all the work that came before. So, everything is cumulative—so, you can't afford to miss any classes unless absolutely necessary. Miss two classes in a TR 10-week course, and you've already skipped exactly 10% of the course—it wouldn't be surprising if your performance (i.e. final grade) in the course dipped by a similar amount. a skilled beginning level programmer. This course moves quickly. So attendance is very important. We'll sometimes cover two or even three chapters in a given week. We need to go at that pace, because during the last week of the quarter, you can't really start anything new, because there isn't time to put it into practice with programming assignments. If you don't put it into practice, you aren't very likely to learn it in any way that is going to stick with you, so there isn't much point in just "going through the motions". As a result, there will be something you have to turn in at almost every class. In this way, attendance is taken, and required. These things you have to turn in will be a combination of in-class activities, and homework completed outside of class, but handed in on paper during class. If you miss a class, you miss the opportunity for the points on that in-class assignment, or homework that was due. Period. To make up an assignment from a "sick-day/personal-day", you must email me within 48 hours of the absence, to make an appointment to make up the assignment during the next scheduled office hours following your absence (or at an appointment time to be negotiated, if you have a conflict with those hours.) This make up must happen within one week of the absence, or 24 hours before the final exam, which ever is earlier. In rare cases, if there is a documented family emergency, documented extended illness, documented required court appearance, or other situation beyond the students' control (with documentation) the instructor may grant additional make up days entirely at the instructor's discretion—but this is not a guarantee or a right. It is expected that students attending the University of California understand and subscribe to the ideal of academic integrity, and are willing to bear individual responsibility for their work. Any work (written or otherwise) submitted to fulfill an academic requirement must represent a student’s original work. Any act of academic dishonesty, such as cheating or plagiarism, will subject a person to University disciplinary action. Using or attempting to use materials, information, study aids, or commercial “research” services not authorized by the instructor of the course constitutes cheating. Representing the words, ideas, or concepts of another person without appropriate attribution is plagiarism. Whenever another person’s written work is utilized, whether it be a single phrase or longer, quotation marks must be used and sources cited. Paraphrasing another’s work, i.e., borrowing the ideas or concepts and putting them into one’s “own” words, must also be acknowledged. Although a person’s state of mind and intention will be considered in determining the University response to an act of academic dishonesty, this in no way lessens the responsibility of the student. Most of the programming work in this course will be done using a style of programming known as "pair programming". This is where two people (in rare cases, three) work together at the same terminal to solve a programming problem. It is similar, in some ways, to having a "lab partner" in a Biology, Chemistry or Physics course. Pair programming is a real-world skill that is highly valued by employers. Many companies use pair programming extensively (including the Santa Barbara based software company AppFolio, where several UCSB grads work). Companies that employ UCSB CS and CE grads tell us that our graduates have good technical skills but need better skills and working in pairs and groups to solve problems. Incorporating pair programming into our curriculum is part of our response to this "real-world" feedback. Most students find it helpful and enjoyable—UCSB CS students from 2009-2010 that were surveyed about their pair programming experiences overwhelmingly reported positive results. There is also evidence in the scientific literature that it improves student learning, and helps you get better grades. To learn more about pair programming, watch the following video (it takes less than 10 minutes). As mentioned above, one of the things we really want to convey in this course is that real-world software development is very seldom an 'individual sport'—is it much more often a 'team sport'. Companies want to hire CS and CE graduates that know how to collaborate with others on producing software. In the CS Department at UCSB, we understand the value of this. However, it puts us in a tricky position. On the one hand, we want to encourage working together in ways that help you develop your skills and teamwork, and help you understand that programming can be a social, collaborative, creative activity—not something done only by loner nerds in cubicles. The sooner you start with activities such as pair programming, code reviews, and other collaborative software development activities, the more skill you'll develop, and the sooner you'll be ready for the real world. Plus, for many people, working together with others is a lot more enjoyable and fun than being a loner. On the other hand, we need to avoid any situations where freeloaders are "coasting" through courses by leaning too much on others—never developing independent skills as programmers. This situation creates huge problems. Mostly it is damaging to the freeloaders themselves, who eventually crash and burn, perhaps far too late to choose another career path without significant difficulty. However, it also creates problems for everyone else—some hardworking students become demoralized by the unfairness of it all, and the value of a UCSB education is diminished by the freeloaders' lack of accomplishment. Thus, we must strike a balance. We will try to create opportunities for you to work in pairs on assignments—in some cases, we may even require it. We will try to create opportunities for you to develop the ability to think critically about software development by talking about and reflecting on your own code and other people's code in small groups (code reviews). Some in-class assignments will permit discussion with other students. You may not "just copy" homework or code from others and claim it as your own work. You may not work together on assignments unless you've been specifically told that it is allowed. We'll try to be very specific about what kinds of collaboration are permitted, and what kinds of collaboration are not permitted, and are considered a form of academic dishonesty. If you are not sure about whether some kind of collaboration is permitted or not, it is your responsibility to ask questions. A final note: the emphasis on collaboration in this course does not necessarily extend to other CS courses you may take in the future. Each course will have its own policies, and the default policy is still: no collaboration. Please be sure you understand each instructor's policy on collaboration carefully, and don't assume it will be the same as that from previous courses. And, finally, be sure to review the UCSB Academic Honesty Policy. You should read and understand the UCSB policy on academic honesty listed below. You should also understand that I take academic honesty and personal integrity very seriously, and will do my best to uphold and enforce this UCSB policy. Do we need to bring our textbook to lecture? To lab? It is generally not necessary to bring the textbook to lectures for CS8. It may be helpful to bring the book to lab though, as it may be a useful reference for working on programming assignments. If you want to ask a question about something specific from the reading, and you would like to have the textbook to refer to. If you happen to have some "unscheduled time" immediately after the lecture ends at 3:15, and you can take that time to do the homework for the next day's class. You'll get the assignment in class, and if you have your textbook with you, then right after class you can start on it right away and get it done. This is the best time to work on it, while the topic of CS8 is fresh in your mind---and starting early gives you more chance to ask me and the TAs questions in case you are not sure about something. Do we need to bring laptops to class? You do not need to bring a laptop to class. Are we permitted to use laptops during lecture? Some instructors are bothered by students having laptops in class—and I can definitely understand this, especially in cases where students are not actually using the laptops to take notes, or try out code, but instead to read email or Facebook, play games, etc. That latter use can be a real distraction to others sitting behind that student, not to mention the distraction to the laptop user herself/himself. So, you don't want to be "that guy" or "that gal" that spoils it for everyone else. If you use a laptop, use it for legit purposes during class time. What about laptops in lab? using the Linux environment helps facilitate the whole "pair programming" thing—it it's "your" computer, your pair partner is likely to feel less comfortable than you. Using the shared machines "levels the playing field". This isn't an absolute prohibition. If the Linux machines are having software or hardware problems, or there is a problem with your account—these things happen rarely, but they do happen sometimes—then, sure, go ahead and use the laptop during lab. But otherwise, please stick with the machines provided. Do we need to download anything to our laptops or computers at home/in the dorm? You may also want to install Python on your system, but be sure you get the right version. A version that start with the number 3, not a version that starts with the number 2. At the time I'm writing this syllabus, version 3.1.2 is the best one to download. That may change by the time you read this. My suggestion—wait until we've talked more about this in lecture before starting to install things. This syllabus is as accurate as possible, but is subject to change at the instructor's discretion, within the bounds of UC policy.